Denver is a consolidated city and county on the Colorado Front Range. Denver County covers 155 square miles and had a 2010 population of 600,158. The Denver Metropolitan area, which includes Denver, Arapahoe County, Jefferson County, Adams County, Douglas County and Broomfield has a population over 2.5 million. James W Denver (1817-1892) was born near Winchester, Virginia. His family moved to Ohio in the 1830s. He joined the army and became a captain under General Winfield Scott during the Mexican American War. During the war Captain Denver traveled to California. On August 2, 1852, Denver shot newspaper editor Edward Gilbert in a duel. He then became a State Senator of California then elected as a Democratic Congressman from California. President James Buchanan appointed James Denver as Commissioner of Indian Affairs, then to the position of Territorial Governor of Kansas in 1857. At the time, "Bleeding Kansas" was involved in hot political battles over slavery. Governor Denver resigned before knowing a city took on his name sake. During the Civil War, James Denver became a brigadier general. His first served at Fort Scott in Kansas then as head of the 3rd Brigade/5th Division under Maj. Gen. William T. Sherman in Tennessee. After the war Denver became a lawyer in Washington DC. His name was floated a a Democratic candidate for president but was not nominated. During his career, Denver visited Denver twice (in 1875 and 1882) to little fanfare. Denver was founded by General William Larimer in during the Pikes Peak Gold Rush of 1858 on the confluence of Cherry Creek and the South Platte, across from the mining town of Auraria. It was named after James W. Denver with hopes of gaining favor of the current Governor of Kansas Territories. Denver City became the county seat of Arapahoe County in 1861 with the formation of of the Colorado Territory. Denver became the Territorial Capitol in 1867 and State Capitol when Colorado was admitted into the Union on August 1, 1876. The Colorado State Capitol building was constructed in the 1890s. The base of the building has the elevation of 5280 feet earning Denver the title of Mile High City. The Capitol Dome is plated in Gold to commemorate the Colorado Gold Rush. The consolidated city/county of Denver was created in 1902 elevating Littleton to the County Seat of Arapaho County and Brighton to the county seat of the newly formed Adams County. Despite the decision to run the Transcontinental Railroad through Cheyenne, Denver became the primary commercial capital of the Mountain West with the construction of the Denver Pacific Railway in 1870. The Denver Color project is a modest effort to promote local web development and community awareness in Denver. 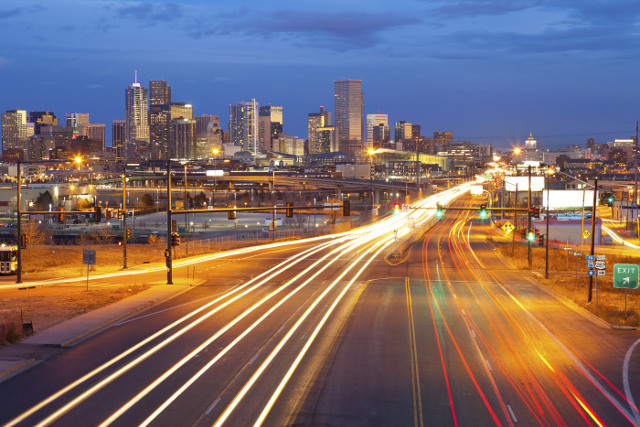 Our tumblr site has pictures of the Mile High City.